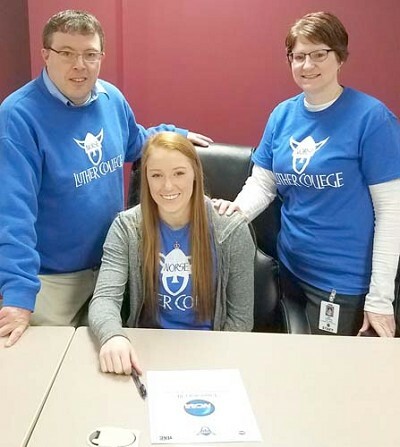 Emily Rinken, a two-year starter at libero for the Stewartville volleyball team, signed a National Letter of Intent to play for Luther College. Above, Rinken was joined by her parents Bill and Amy at the signing on April 12. Rinken, a MSHSL All-State selection her junior and senior seasons, posted impressive career numbers, including 1,619 of 1,701 or a 95.2 serve receive percentage; passed 1,492 of 1,701 or 87.7 percent to the setter; and recorded an impressive 1,222 career digs. Rinken earned Academic All-State honors as a senior and was also named to the HVL All-Conference and the Post Bulletin's All-Area teams both of her starting seasons with the Tigers.